What if happenstance catapulted you into the national spotlight as a “third party candidate” for president of the United States? 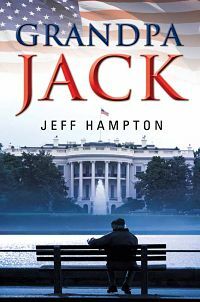 That is exactly what happened to Jack Dodger in Grandpa Jack by Jeff Hampton. Jack is an almost 70 year-old, retired man who just wanted to play cards with his friends in the back of his “retirement” barbershop business and spend time with his granddaughter, Wendy, dubbed by Jack as his “Little Blossom” and his constant canine companion, Blackie. What ensues is a sometimes funny, sometimes sad, sometimes passionate run for the presidency with a motley crew of people as advisors and the backing of the Golden Eagles, a national organization of senior citizens. The campaign workers had to make decisions on a “platform”, make plans on how and where to campaign and most of all pick a running mate for Jack. When Wendy volunteered to be the VP candidate, media aide Billy Briar used that to answer questions about the search. With this accomplished, they began to campaign in earnest. The road to the White House was filled with surprises, meeting new people and winning them over to their way of thinking. How did Jack run his campaign? What promises did he make? What were the obstacles and rallying points? Will he make it all of the way to the White House and the Presidency? Read this stimulating and attention-grabbing take on the presidency to see what happens. Grandpa Jack is a quick, enjoyable read. You will enjoy the premise put forth as well as the tale of this senior citizen hero. I know I did and I am looking forward to future books like this from Mr. Hampton. Jeff Hampton has covered election campaigns and the civic and business leaders who have shaped the Greater Dallas region. His bylines have appeared in publications such as the Dallas Morning News and The New York Times. He is the author/editor of several regional and corporate history books. He is the co-creator of “The Last Cowboy” an award winning stage play. He now lives in old downtown Garland with his wife, LeAnn.